Charles Babbage was an English genius of legendary eccentricity. He invented the cowcatcher, the ophthalmoscope, and the “penny post.” He was an expert lock picker, he wrote a ballet, he pursued a vendetta against London organ-grinders that made him the laughingstock of Europe. And all his life he was in desperate need of enormous sums of money to build his fabled reasoning machine, the Difference Engine, the first digital computer in history. Babbage’s computer, and to photograph it with the newly invented camera of Louis Daguerre. Suffice it to say that in Shooting the Sun nothing is what it seems, eclipses have minds of their own, and even the best computer cannot predict treachery, greed, and the fickle passions of the human heart. 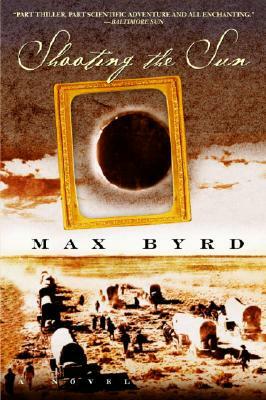 Max Byrd is the author of the bestselling historical novels Jefferson, Jackson, and Grant. He makes his home in Davis, California. "An engaging travelogue along the old Santa Fe Trail, served up with plenty of authentic frontier detail." "Full of insights and laced with subtle humor.... The author shows us every detail of the trip, from the attitudes of the day to how to find water in desert sand and preparations for a Kiowa Sun Dance."